This statement opens an important new study from the Observatory on Borderless Higher Education (OBHE), and it kicks off a wide-ranging survey of the scale and shape of online learning in key markets around the world. “Distance, Not Online.” These markets have a large distance learning sector but one that makes little use of of online learning (e.g. Egypt, India). “Online Learning as Marginal.” These education systems are characterised by strong growth in enrolment on campus, but with very modest use of online learning (e.g. Saudi Arabia, UAE and Sub-Saharan Africa). “Blurred Growth.” The OBHE considers that these countries have a muddled online learning context, with elements of distance learning, that nevertheless is growing more quickly than conventional delivery modes (e.g. Mexico, Spain). 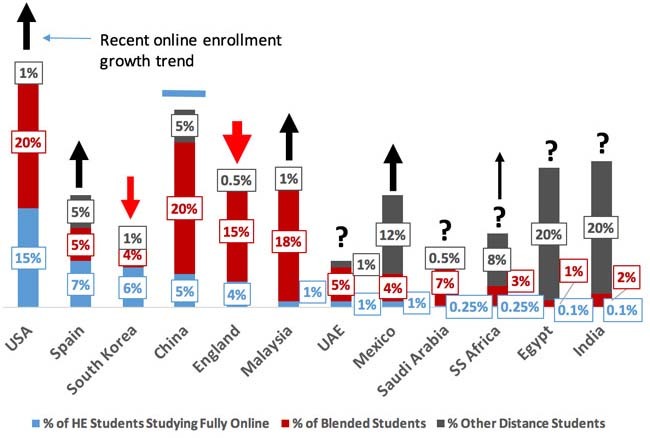 “Clear Online Growth.” As distinct from “Blurred Growth” markets, these countries feature a clearly defined online learning sector that is growing more quickly than campus-based programming (e.g. United States). “Peaked/Decline.” Countries belonging to this final group have seen their online enrolment flatten or even decline in recent years (e.g. England, South Korea). Keeping those broad categorisations in mind, the following chart provides a summary of the market share of online learning, and recent growth trends, for the 12 case study countries and regions. One of the questions that the study aims to explore is why online learning has grown in some markets, but not in others. In the two markets where online and distance learning are more established – the US and China – the OBHE sees some common factors at work. This essentially boils down to a systemic commitment to online learning as a means of serving student populations that might otherwise have difficulty accessing higher education, whether because of geography, affordability, or lifestyle factors (i.e., family or career commitments). Of particular relevance to international recruiters, the study also considers the extent of online provision across borders – that is, the scale of “virtual international mobility” where students pursue online programmes offered by an institution overseas. Even acknowledging that data on cross-border enrolments is limited in many markets, the OBHE finds little evidence of growth in this area. Looking back over a decade or more, total growth in international mobility has been significant, and the volume and variety of transnational education has also expanded considerably via more conventional modes such as international branch campuses and joint or dual degree programmes. In the following chart, we see this pattern playing out through the examples of Australia, the UK, and the US as it tracks the volume of higher education provision for inbound cross-border students, those enrolled in campus-based TNE initiatives, and those following distance or online programmes that reach across borders. The overall growth rate since 2009 is also shown for each delivery mode. In the final analysis, the report anticipates a continued variability by market going forward in terms of the pace of adoption and nature of online learning provision. The OBHE projects continued growth in the sector, buoyed in large part by the strong underlying global demand for higher education. Its view of the sector’s outlook, however, is more tempered than the revolutionary forecasts offered in the past by other observers. This entry was posted in Asia, China, Egypt, Europe, Higher Education, India, Malaysia, Mexico, Middle East, North America, Online Learning, Regions, Saudi Arabia, South Korea, Spain, UAE, United Kingdom, United States and tagged colleges with international students, undergraduate student recruitment, distance education, online education, MOOC courses.